Whether you’re hosting a Halloween party or attending one, the most important thing (aside from your costume) is serving up some spooky appetizers for Halloween that actually taste good. 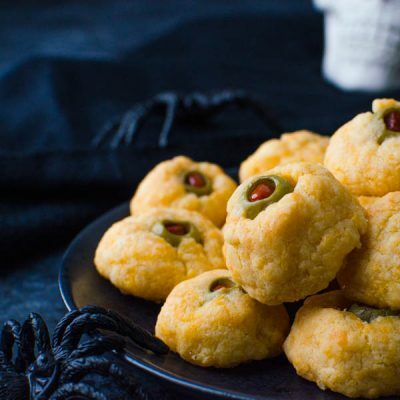 These eyeball-esque Cheese Olive Balls – are savory bites that everyone enjoys. Make up a batch of witches brew and serve these Halloween party appetizers for a ghoulish treat. A few years ago, I was invited to a Halloween party for adults. I dressed up like a Geisha — with full white face, a wig and a shiny gold and red kimono. Scott went as a Samurai — replete with sword and creepy makeup. When we got to the party, they had tapped a keg, had a few jugs of wine and had laid out some holiday-themed snacks… things like dirt cake with gummy worms coming out of the “ground,” witches hat oreo cookies and marshmallow ghosts. However, there were no savory Halloween appetizers. Just sweets. I can’t do alcohol AND sweets together, so I ended up with drinking way more than I intended, with nothing to soak it up — and at the end of the night, I made Scott stop on the way home for a much needed burger break. Picture a tipsy geisha scarfing down a quarter pounder with cheese at midnight. Not pretty, folks. That party made me think — there had to be Halloween food ideas for adults. Halloween party appetizers that leaned toward an adult palate. 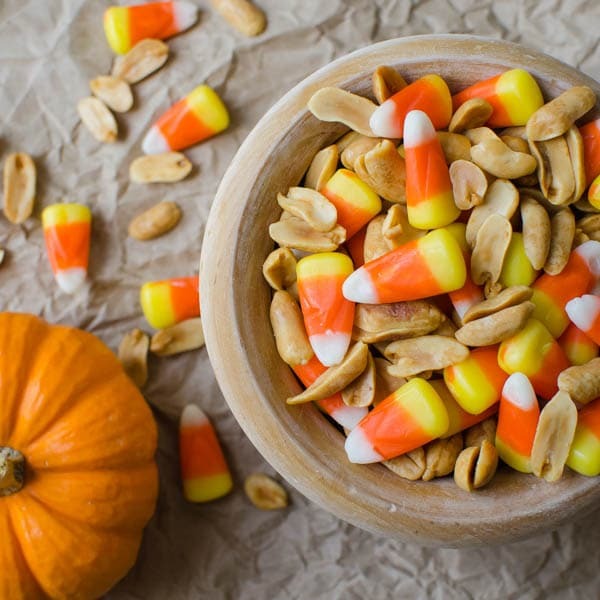 Creative Halloween appetizers that you could serve at a regular cocktail party, just by changing up the presentation. Most of all, easy Halloween party snacks that don’t require a sculpting class to make. These Cheese Olive Balls fit the bill, perfectly. 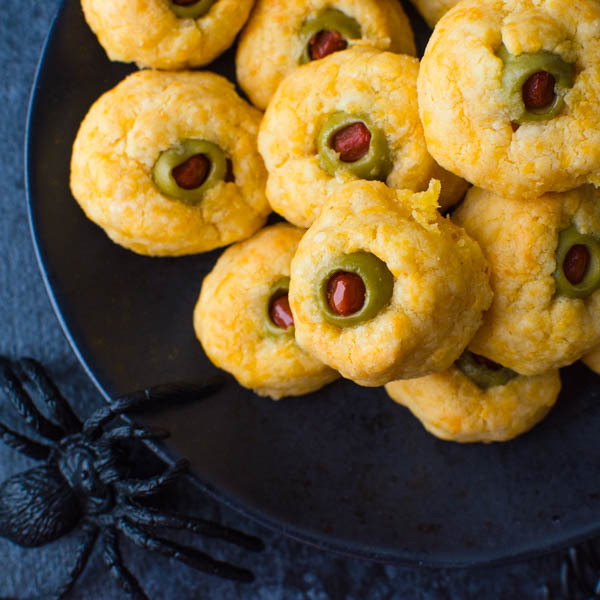 With just a handful of pantry staples, some grated cheddar cheese and a few jars of Manzanilla olives, you can make Halloween party appetizers that everyone will love. Combine the flour, mustard & cayenne in a large bowl and whisk together. Add the cheddar cheese and toss to coat. Stir in the melted butter, until the mixture becomes hard to stir. 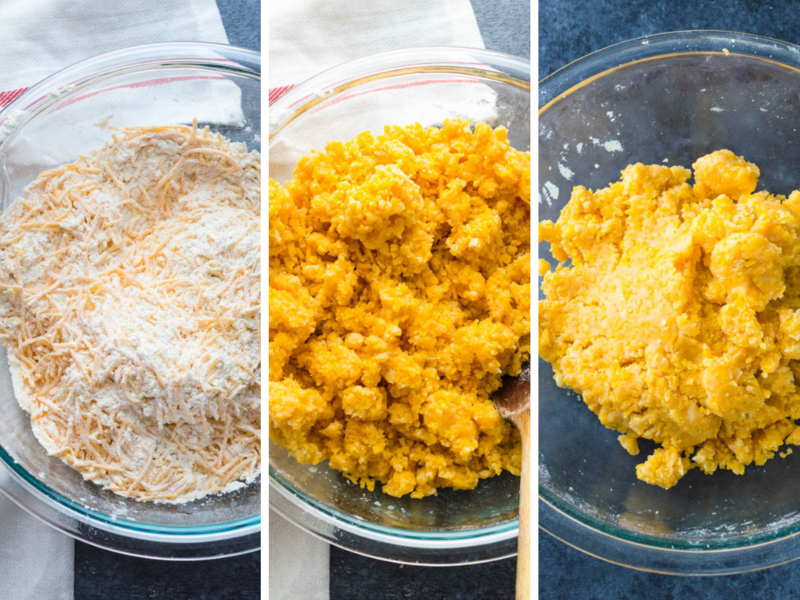 Use your clean hands to work the cheese mixture into a soft dough. Drain the olives and pat dry with a paper towel. Pinch off a teaspoon sized bit of dough and flatten it into a circle. Place the olive (stuffed side up) in the center of the circle and mold the cheese dough around it so that only a little green olive and red pimento show through. Transfer to a cookie sheet and refrigerate for one hour. 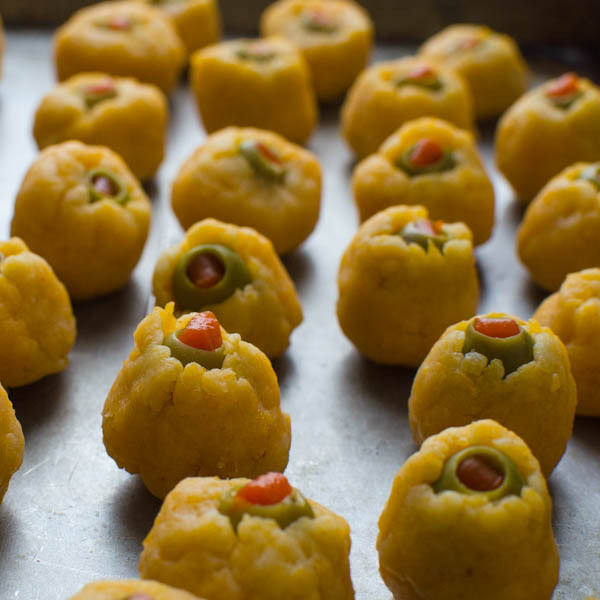 Preheat the oven to 400° and bake the cheese olive balls for 15-20 minutes or until golden. Transfer to a serving platter and enjoy while warm. My taste testers loved the cheesy baked puff with the briny olive inside. I think what makes these cheese olive balls special is the mustard and cayenne in the mix. Dry mustard inherently makes cheese taste — cheesier. I also use dry mustard to enhance the cheese flavor in my Mac n’ Cheese and these Pecan Cheddar Crackers. 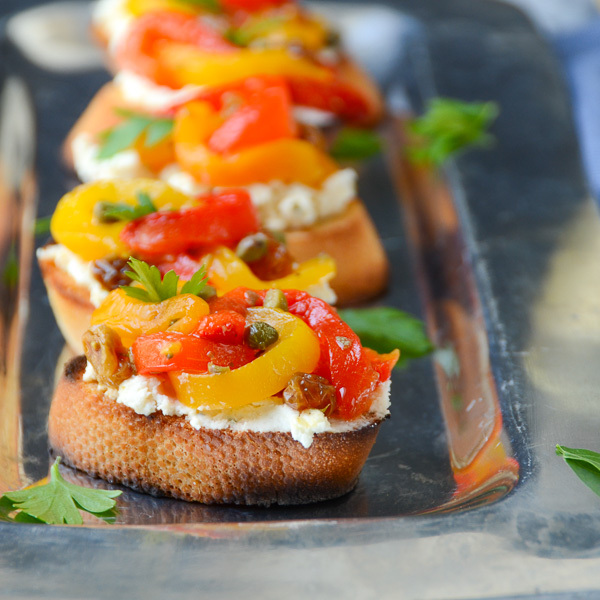 The spice of cayenne isn’t overpowering in these hors d’oeuvres, but if you like a little more heat, you could add a pinch or two more to the flour mixture to increase the tingle factor. 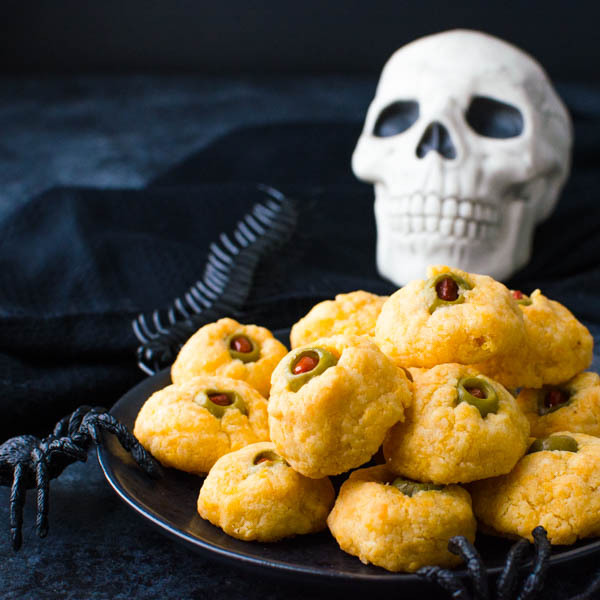 Obviously you’ll want more than just a few cheese olive bites to munch on at your party, so I’ve asked some of my fellow bloggers to share their favorite savory Halloween appetizers. 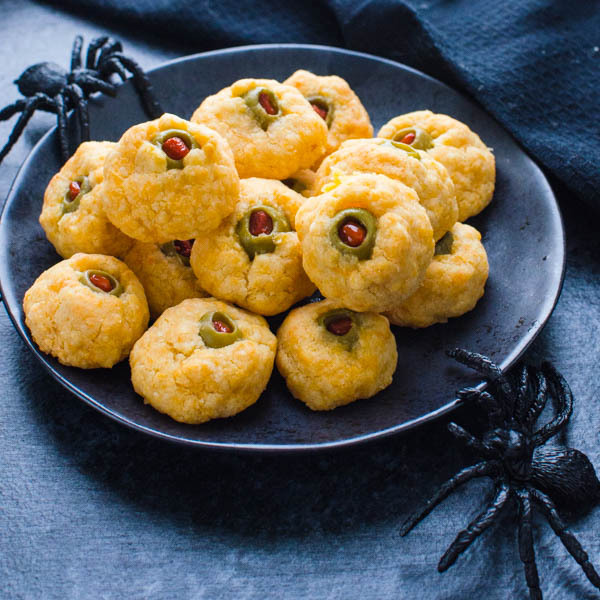 Incidentally, if you’re looking at this recipe and it doesn’t happen to be Halloween, these Cheese Olive Bites are a great appetizer anytime. Just mold the cheese dough completely around the olive and bake as usual… Now you’re ready for any holiday or get together. 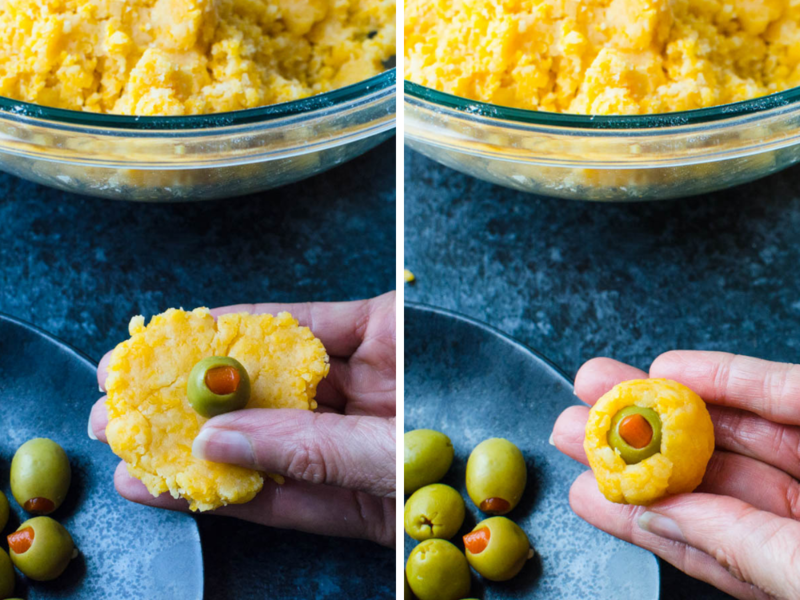 Little cheese ball puffs stuffed with manzanilla olives -- great for Halloween, or cover the whole olive in cheese pastry for a delicious hot appetizer for any occasion. Based on a recipe by Betty Crocker. In a large bowl, combine the flour, mustard and cayenne pepper. Whisk to combine. Add the cheddar cheese and stir to coat the cheese. Make a well in the center of the cheese mixture and add the melted butter. 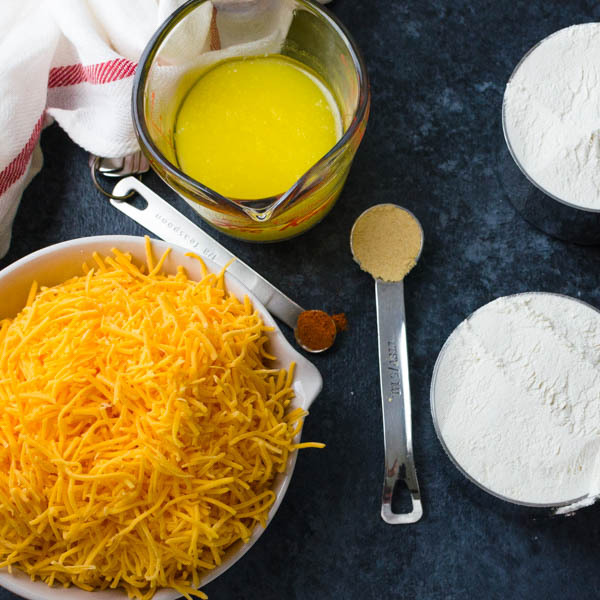 Use a wooden spoon to combine the flour, cheese, butter mixture. The mixture will become harder to stir and that's when you use your hands to fully combine the cheese dough. Scoop 1 teaspoon of dough and shape it around the olive, taking care to allow the pimento and part of the olive to show through the dough. Transfer to a baking sheet. Continue to form "eyeballs" with the rest of the dough and olives. Refrigerate for one hour before baking. 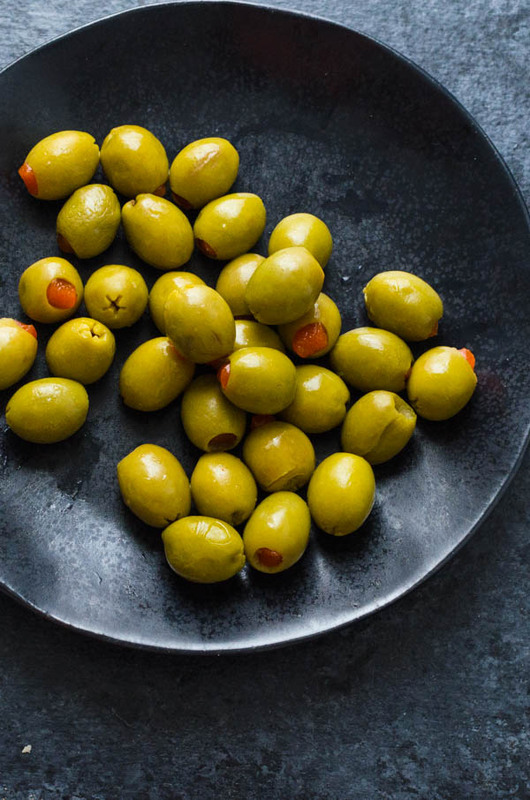 While the olives chill, preheat the oven to 400°. Bake the cheese olive bites for 15-20 minutes or until golden and puffy. Transfer to a platter and serve. Can be made ahead to this point and frozen, not touching in a single layer for two hours or until solid. Transfer to a freezer bag and keep frozen for up to 3 months. Thaw before baking, using the baking instructions above. 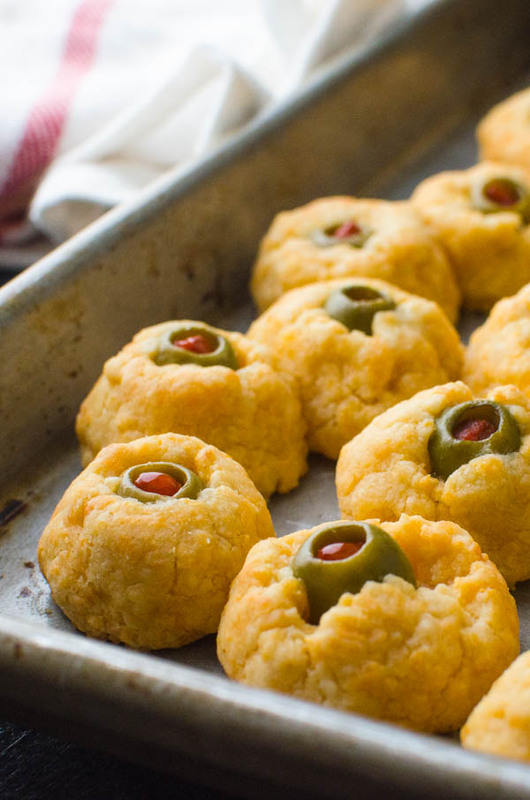 Pin “Cheese Olive Balls” For Later! So cute for Halloween! But really, what awesome flavors you have here. 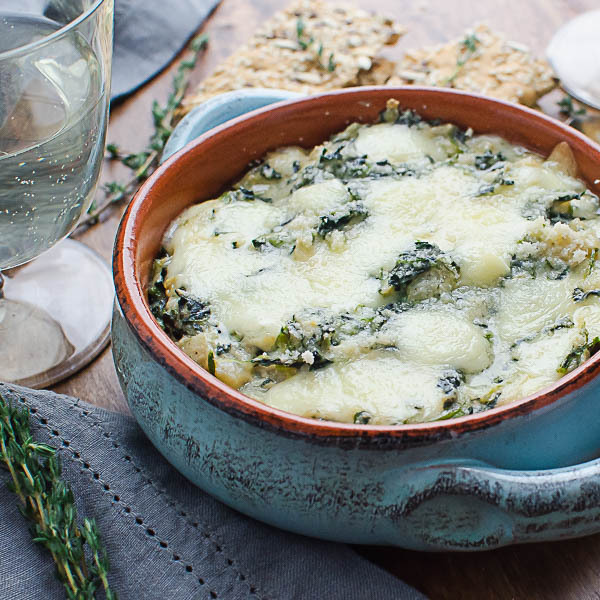 Love the cheesiness and the olives – would be perfect for appetizers any time of year! How cute are these?! So perfect for Halloween and fall parties. Love! Oh yum! My whole family would go crazy for these! This recipe looks super easy and full of ingredients my family loves. Looking forward to trying soon. I hope they enjoy them — my taste testers went back again and again. These cheese balls look super cute! I can eat the whole bowl! Love these!! They’re so yummy and perfect for halloween!